Great news for all our PISO FARE friends! Air Asia announced today that Air Asia Red Hot Sale 2018 will be available starting June 5, 2017! This post is a PROMO ALERT ONLY to disseminate the information to all our valued readers. Booking has not started yet. 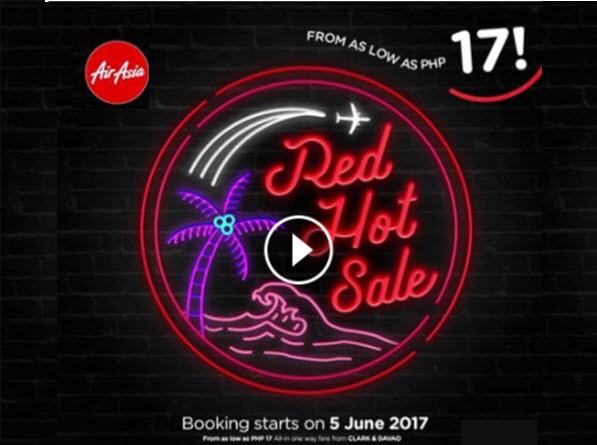 If you are looking for cheap tickets for your trips, be ready to book your flights via the Air Asia Red Hot Sale on 12AM, Monday, June 5, 2017. BIG MEMBERS will have the priority to book tickets as early as 12AM on June 4, 2017. Avail tickets for January 15-31, February, March, April, May, June, July and until August 28, 2018 trips. See? You have 8 months of travel dates to choose from. This means also you can get tickets for your 2018 summer getaways. Get ready with the incoming promo by looking at the List of Holidays for 2018 so you can decide your flight dates. Air Asia flies to these local Philippine destinations: Manila, Cebu, Davao, Boracay, Clark, Puerto Princesa, Tacloban and Tagbilaran. The airline has international flights to Kuala Lumpur, Kota Kinabalu, Taiwan, Seoul, Macau, Guangzhou, Hongkong and Macau. Air Asia announced that fares as low as P17 will be available on this sale. Destinations covered and ticket prices for specific routes are not yet known. We will update you once we have the info on the ticket rates. Booking for this Red Hot Sale is from June 5-11, 2017. The Air Asia Red Hot Sale promo is on a FIRST COME, FIRST SERVE BASIS. Tickets are LIMITED so you better reserve your tickets as soon as booking starts by June 5. So, stay tune and wait for our next updates! LIKE our Facebook page: PISO FARE TICKET for more updates on Air Asia Red Hot Sale 2018!! !